Let me give a few examples of people who would find this program helpful. I have a dual monitor setup. While playing Call of Duty Modern Warfare 2 the game never shows me what my ping is. It just shows a little bar. So when my ping is bad i have no way to tell just how bad it is. So now I have Simple Ping running on my 2nd monitor. Now as I play I can keep an eye on my ping at all times. While playing on the net with your Wii, PS3 or Xbox you may need to keep an eye on your ping. You can have this tool running on your computer while you game. Some users have their computers or laptops close by. When the game starts to lag you can keep an eye on the ping. While online you notice some pages are loading slow, you have other people in the house using the net as well. You see the ping is rather bad. You realize someone else is tapping the net to its fullest. You go check and find your brother/sister/mother/father/kids ect. are downloading a huge movie off Netflix or something. Since the net is being fully used up the net goes slow for you. You promptly beat them with your shoe and tell them to get off. 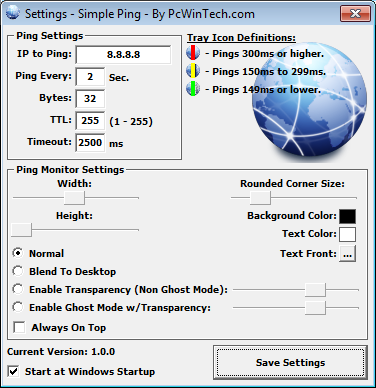 In the settings window you have a lot of options to control the look and feel of the ping monitor. These settings are pretty much self explanatory. Have a request or problem? Drop a line in the forums.